It's no secret I love lingerie! Half of my shop is made up of vintage lingerie. When collecting it is what I always gravitate towards. I also worked in the lingerie industry for 6 years and am an avid collector of the modern variety as well. All of that combined with a thirst for fashion history means I'm dedicating the next 7 or 8 Fashionable History posts to Lingerie By Decade! Starting with the 1920s through the 1980s...maybe 1990's; we'll see! Tallulah Bankhead in "Her Cardboard Lover"
As with all foundation garments we have to consider what is worn over them in that time period as well as what is happening in the world. In the 1920's women are gaining more freedom. Corsets are still worn but they are starting to get in the way. Women became the work force in the decade prior during WW1. With the war now over, 1920s youth want to have fun. Corsets are not your friend if you want to be asked to do the Charleston! They also make it hard to work and drive a car. Lingerie starts to reflect these new attitudes and chemises or step-ins (pre-curser to rompers and teddies) start to become popular. Dresses worn over them are loose and of a similar boxy shape. Your chemise either hides your corset seams or if you're a rebellious flapper, the corset is discarded all together! The model above exerts more movement than her Victorian ancestors had! 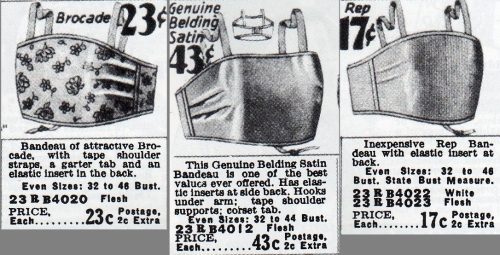 Sometimes corsets were worn over the chemises to aid in defining a boxy, slim hipped shape, as seen below. 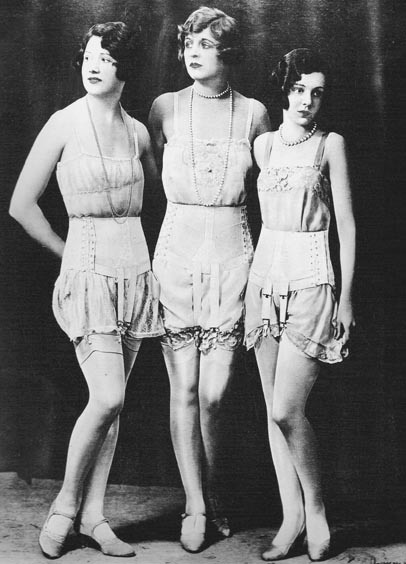 I've even heard of "corset checks" at dance clubs where girls would take off their corsets their parents made them wear when they left the house- but were in the way of flapper frivolity! If you didn't wear the corset you would wear single garters above the knee to hold your stockings up. Chemises were often made of fine silks and sanitized rayons. Rayons were a great middle class version of silk that took dyes really well. Popular colors were peach and pink. Fine laces and floral trimming was also very popular. The boyish look actually started in the Teens. Again, women are working with men away at war. Mary Phelps Jacobs filed for a patent in 1914 for a chest flattening brassiere. The look caught on in the 1920's and bandeau bras became popular for taking away all curves. Rubberized versions to hold you in also start hitting the market. Pajamas become very popular in the 1920s, even entertaining in them! Not all that different from modern versions but most definitely made of fine silks, ruffles and feathers, all the while continuing that boxy and loose shape! This concludes our history of 1920s lingerie. Stay tuned for next month's installment covering the 1930s. Fashionable History is a monthly Bobbins and Bombshells blog series. Catch up on the series here and from my older blog here. Shop for vintage lingerie here. Shop for handmade garters here. Images from pinterest, google, and flickr. Flaxen Lady. Vintage 1920's Cloche. Daphne. Vintage 1920's Pink Silk Chiffon Nightgown Mint Lace. Size L.